Although its latitude (48°52'0"N) is roughly the same as Vancouver or the Island of Newfoundland in Canada, the City of Paris benefits from a temperate climate as a result of its location in Western Europe and the warming effects of the Gulf Stream. Nestled in the Paris Basin, situated midway between an oceanic climate to the west and a semi-continental climate to the east, Paris enjoys mild winters and relatively clement summers. The average temperatures in Paris generally range between 5°C (41°F) during winter and 20°C (68°F) in summer. July is the hottest month of the year, and January is the coldest. As a rule, it is slightly warmer in Paris than in the suburbs. The effects of urbanisation result in significant differences of temperature between the city's center and the outskirts, regularly recording one or two degrees higher at Paris Montsouris1 or at the Tour Saint-Jacques, as compared to Paris Le Bourget Airport which is 9 km outside the city. During the past century, the coldest winter was in 1953-1954, when the thermometer dropped to -15°C (5°F). The coldest day ever recorded was on 10 December 1879: -23.9°C (-11°F). While the hottest recorded temperature reached 40.4°C (104.7°F) on 28 July 1948, the deadly heatwave of August 2003 produced nine (9) consecutive days of temperatures exceeding 35°C (95°F). These temperatures are quite exceptional, however. Spring, from March to May, is the driest season. Rainfall is distributed fairly evenly throughout the other seasons. Average annual precipitation is 607-641 mm (24-25 inches). The most rainfall recorded in a single day was on 24 August 1987: 95.7 mm (3.77 in). Paris is known for its frequent showers, which tend to pass just as quickly as they arrive. It is not unusual to witness bright sunshine one moment, then a quick shower followed by a return to sunshine — all within the course of a few minutes' time. For instance, there are about 171 days a year with precipitation of over 0.1 mm (0.004 in. ), yet only 16 days with more than 10 mm (0.4 in.). Thus, it is practical to carry a small umbrella with you in all seasons. Thanks to its temperate climate, however, snowfall is somewhat of a rarity in Paris. Although there is at least a dusting of snow about 15 days a year, most accumulation generally disappears within 24 hours. The highest snowfall ever recorded in one day was 40 cm (15.75 in) on 2 March 1946. The windiest months in Paris are generally from November through January, averaging 21-23 km/hr. (13-14 mph). During the rest of the year, the city enjoys pleasant breezes of 15-18 km/h (9-11 mph). When extreme storms battered much of western Europe on 27 December 1999, the Paris region suffered a loss of tens of thousands of trees and extensive property damage, with wind gusts reaching 169 km/h (105 mph). Fahrenheit Celsius in mm A.M. P.M. miles/hr. km/hr. Notes: (1.) In operation since 1872, Parc Montsouris is the oldest continual weather observation post in Paris. Altitude is about 75m (246 feet) above sea level. (2.) Weather station Paris/Le Bourget is situated at about 48.97°N 2.40°E. Altitude is about 66m (216 feet) above sea level. (3.) Wind velocity is also commonly measured in meters per second or in knots. Refer to our Velocity Calculator to convert above wind speeds to these other measures. 25.24 in. Brest: 1,110 mm / 43.70 in. Nice: 770 mm / 30.31 in. 3.78 in. Brest: 36 mm / 1.42 in. Nice: 191 mm / 7.52 in. Nîmes: 267 mm / 10.51 in. Besançon: Doubs department of Franche-Comté, central eastern France (29 km from the Swiss border), 47°15' N / 6°02' E, avg. elevation 250m (820 ft) above sea level. Brest: Finistère department of Brittany, northwestern France (Atlantic coast), 48°24' N / 4°29' W, avg. elevation 50m (164 ft) above sea level. Montélimar: Drôme department of Rhône-Alpes, southeastern France (interior), 44°34' N / 4°45' E, avg. elevation 85m (279 ft) above sea level. Nice: Alpes-Maritimes department of Provence-Alpes-Côte-d'Azur, southeastern France (Mediterranean coast), 43°42' N / 7°15' E, avg. elevation 20m (66 ft) above sea level. Nîmes: Gard department of Languedoc-Roussillon, southern France (26 km from Mediterranean coast), 43°50' N / 4°21' E, avg. elevation 50m (164 ft) above sea level. Toulouse: Haute-Garonne department of Midi-Pyrénées, central southern France (interior, 61 km from Spanish border), 43°36' N / 1°26' E, avg. elevation 150m (492 ft) above sea level. Sources: Precipitation data was obtained from the Global Historical Climatology Network (GHCN). Selected weather records obtained from the Mairie de Paris and World Climate. Recommended publications: Rick Steves' Paris 2008 (Avalon Travel Publishing). Leonard Pitt, Walks Through Lost Paris: A Journey Into the Heart of Historic Paris (Shoemaker & Hoard, 2006). Jorg Brockmann, James Driscoll, & Kathy Borrus (Photographers), One Thousand Buildings of Paris (Black Dog & Leventhal Publishers, 2003). 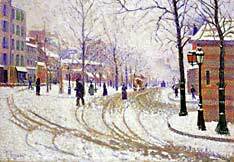 Images: Snow, Boulevard de Clichy, Paris 1886 by Paul Signac, from The Minneapolis Institute of Arts. View the BBC's photos of March 2001 floods, when the River Seine burst its banks after weeks of heavy rain. Realtime newsfeed of French current events, politics, corporate press releases, plus selected news archives, and links to all major French print & broadcast media. Articles change daily, so check back often. Weather forecasts for any region of France, plus teaching resources and a guide to understanding the weather. CNN article describes the creative ways in which Paris residents coped with the heat wave of August 2003. Nominate A Site  Submit An Article! Do you know about a great Paris Weather site we should list here? If so, please submit it!